How can multiple virtual servers be hosted on a single host when the virtual servers’ aggregate memory exceeds the physical memory that is available on the host? A host needs to be able to host multiple virtual servers, even though their total memory configuration exceeds the host’s own physical memory. Memory virtualization is implemented to enable more virtual servers to be hosted on the same host, by allowing the host’s physical memory to be exceeded by the total memory configuration of the virtual servers. One or more memory over-commitment components are implemented. 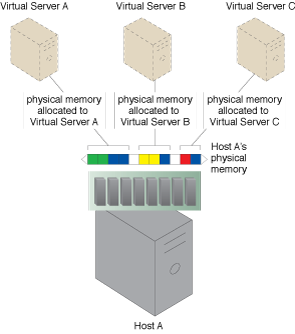 Virtual Servers A, B, and C are each allotted a portion of Host A’s physical memory. 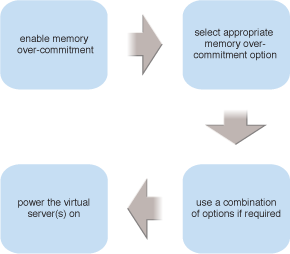 The four steps involved in applying the Memory Over-Committing pattern are shown. Virtual Servers A through F can all be powered on at Hypervisor A.